This freestanding single arm desk mount is perfect for any 17"-27" TV or monitor screen with a maximum load capacity of 13.23lbs. It fits all flat screen monitors and TVs with VESA sizes of 75x75 mm or 100x100 mm. The VESA plate is quick fit and detachable for easy installation. With its +60°/-20° tilt, 30° swivel and 360° rotation, this desk mount is very user-friendly, and it is easy to find the optimum viewing angle. Height adjustment up to 20.47'' with 10 different level settings allows you to work in a more comfortable, ergonomically correct position to reduce neck and eye strain. (Please note: slide from the top to the very bottom of the pole to reset the desired height). 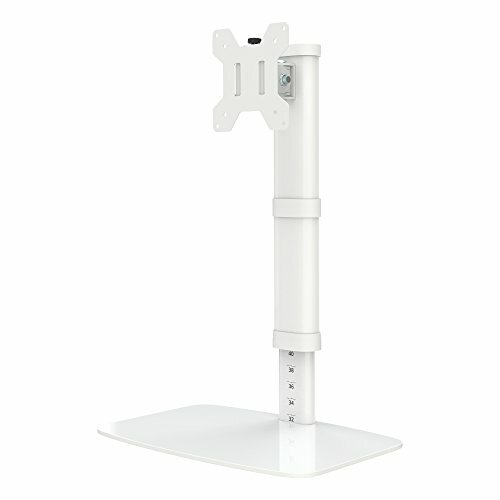 Made of solid steel with white powder coating, this sleek desk monitor mount is very sturdy. Its freestanding base offers enhanced stability and fantastic manoeuvrability. Anti-skid silicone pads protect desk surface from scratches or scuffs. This single arm desk mount features concealed wiring design, along with storage slot for Allen keys, to keep your desk tidy and clean. Delivery includes all the necessary fixtures and fittings plus instructions for simple installation. Concealed wiring design, keeping your desk tidy and clean; storage slot for Allen keys. Comes complete with instructions, plus all fixtures and fittings needed for simple installation.